This owl is quick and easy, using affordable items you probably already have on hand. What You Need: 1 regular-size paper plate and one dessert-size paper plate; cotton balls; scraps of yellow and brown construction paper; black pen; glue; scissors. How You Make It: Cut triangle shape out of large paper plate. Glue small paper plate just above the cut-out part as shown. Cut triangle and two ovals or circles from construction paper and glue on for eyes and beak. Use black marker to add to eyes. 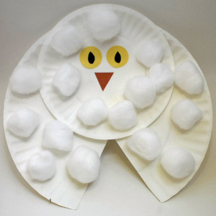 Glue cotton balls all over and you have an owl! Note: If you were making a different type of owl, you could glue the cut-away part of the large plate behind the small plate to make ear tufts. (Snowy owls don’t have ear tufts.) Also, how about making matching snowy owl cupcakes for a preschool theme or lesson on owls? This entry was posted on Wednesday, November 21st, 2007 at 8:40 pm	and is filed under animal crafts, paper plate crafts, winter crafts. You can follow any responses to this entry through the RSS 2.0 feed. Responses are currently closed, but you can trackback from your own site.